M. Maness (2015). Presentation at Frontiers in Transportation 2015: An Update on Social Networks and Travel, Windsor, UK. Existing research on social capital and activity behavior has generally used name generators to analyze core networks to understand more intimate connections. But using name generators and interpreters in surveys increase respondent burden and survey length. The position generator is a technique used in the social science to study social capital and allows for measuring access to networked resources via occupational diversity of network contacts. The influence of these social capital measures is unknown in the context of activity and travel. Since no activity-travel studies have used the position generator previously, a case study using the Pew Internet Personal Networks and Community survey was performed to explore the role of social network occupational diversity in activity participation. The name generator and position generator indicators were compared for explaining and predicting activity participation. Network diversity as measured from the position generator was found to be a reasonable explanatory covariate and predictive variable for activity participation. The network diversity indicator was found to hold more explanatory and predictive power than core network indicators from a name generator. Also, due to the limited use of position generators in travel behavior analysis, the robustness of the social network occupational diversity measure was analyzed. On the measures of model fit (see figure) and bias and variability of parameter estimates, social network occupational diversity was found to be robust to varying position generator lengths. M. Maness (2014). Presentation at the 3rd Symposium of the European Association for Research in Transportation, Leeds, UK. The effect of errors in social network data collection using name generators is not fully understood for choice models. A simulation experiment provides guidance on how popularity and multiple connectivity in social networks correlate with estimator bias. 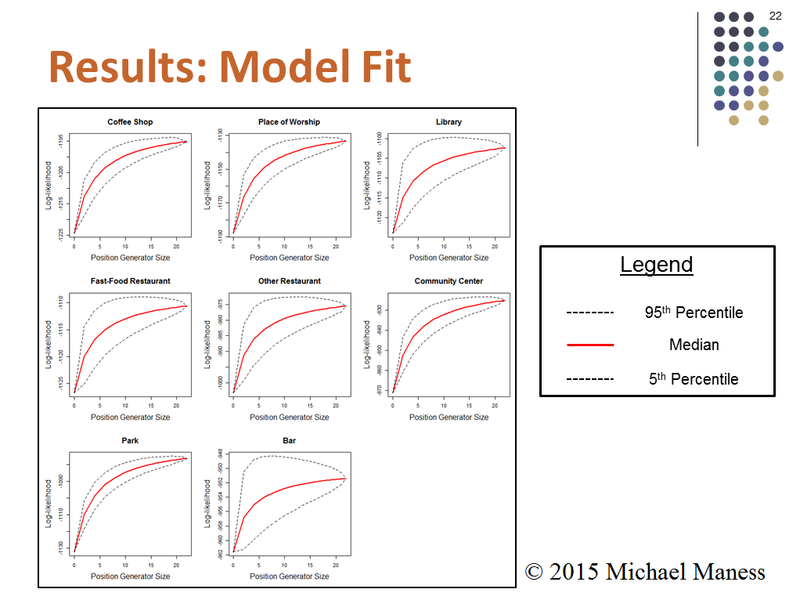 Results show that sample size and the strength of social influence biases estimators more than network shape. M. Maness and C. Cirillo (2012). Proceedings from the 2012 Annual Meeting of the Transportation Research Board, Washington D.C. The culmination of new vehicle technology, greater competition in energy markets, and government policies to reduce pollution and energy consumption will result in changes to the personal vehicle marketplace. To measure future vehicle preferences, stated preference surveys have been the dominant approach. Prior research has been limited to a narrow focus of accelerating respondents to a hypothetical next vehicle purchasing decision without mimicking the marketplace’s influence on this decision. To explore marketplace influences, this project proposes to use a novel stated preference survey design to analyze vehicle purchasing behavior in a dynamically changing marketplace through the use of dynamic attributes and a six-year hypothetical time window. The survey is divided into three parts: household characteristics, current vehicles, and stated preference. The stated preference section presents respondents with various hypothetical scenarios annually over a future six-year period using one of three experiments. The experiments correspond to changing vehicle technology, fueling options, and taxation policy. Between scenarios, the vehicle, fuel, and policy attributes dynamically change to mimic marketplace conditions. A pilot web-based survey was performed during fall 2010. Mixed logit models showed that respondents responded in behaviorally realistically ways and that the survey design allowed for estimation of important parameters in vehicle choice. 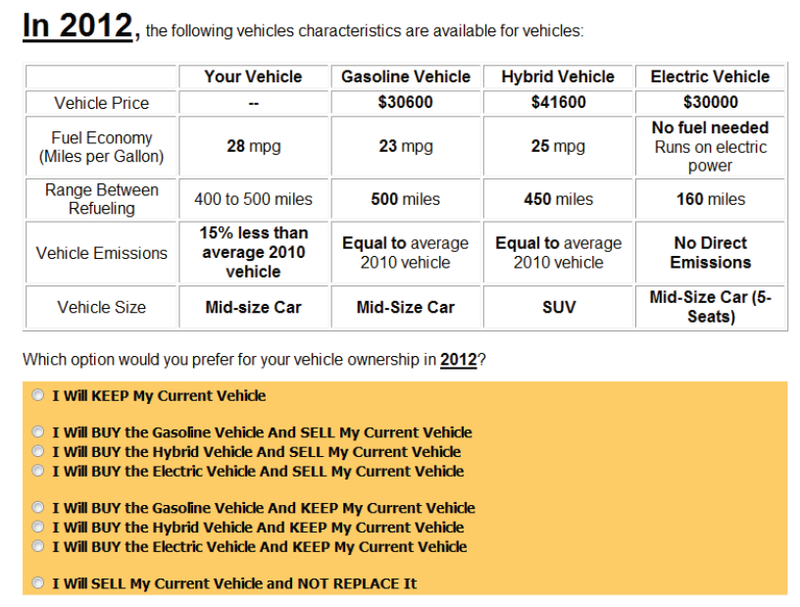 Respondents were able to depreciate their vehicles over the five-year hypothetical period and place tradeoffs on the features of vehicles and fuel types. The insights from the survey are also used to suggest refinements to the survey methods and areas for further research. M. Maness (2012). Proceedings from the 2012 Annual Meeting of the Transportation Research Board, Washington D.C. Bicycle ownership is an important metric in non-motorized travel behavior. Bicycle ownership has been shown be correlated with recreational activity, propensity to travel by bicycle, and injury rates. Thus bicycle ownership may have farther reaching effects on public health, congestion, energy usage, recreation facility demand, and infrastructure investment. This paper proposes to analyze bicycle ownership on a national scale using the 2001 National Household Travel Survey. 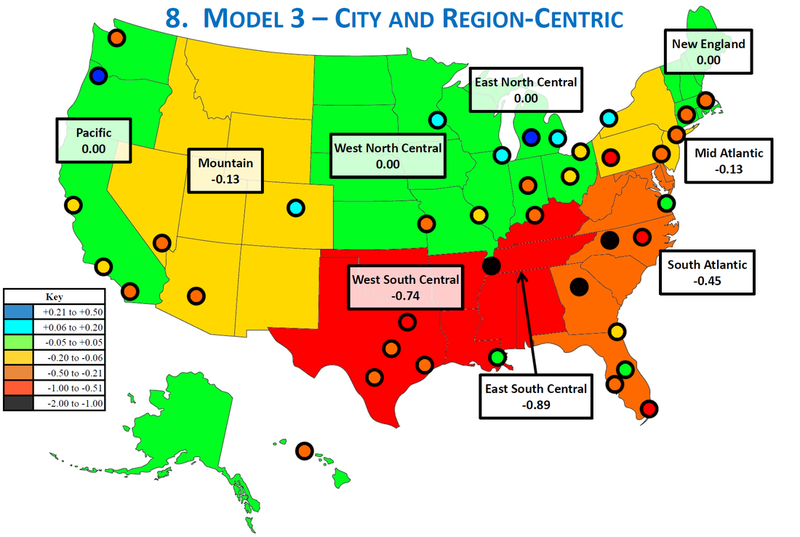 Three ordinal logit models were created which analyzed general trends in household bicycle ownership, regional effects at a micro household scale, and regional and city effects at a macro scale. This analysis showed that larger households owned more bicycles and that educated, higher income households were more likely to own bicycles. Minority households were less likely to own bicycles as well as households in rural areas. Women contributed to bicycle ownership but to a lesser degree than men. Children greatly contributed to bicycle ownership, especially between the ages of 10 and 15. Adult bicycle ownership peaked at middle age and declined rapidly beyond age 55. Divisional and city effects were also found to exist which suggest that local infrastructure investment as well as cycling culture may contribute to bicycle ownership. Further research into the behavioral causes of many of these effects is suggested.